Haste! WoD MMO Cancelled, Ryan Dancey talks OGL, and Physical Props. Don’t forget that the d20 Monkey contest is going on and that you’ve still got a little bit of time left to submit to our April’s fool contest! Also, be sure to check out part 2 of our interview with Rob Schwalb. Also – we’re hiring a Background Image Designer! Lastly, check out adventureaweek.com, of which our good friend Justin Mason is a part of. 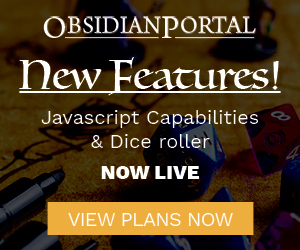 A continual source of adventures for your D&D 3.5 or Pathfinder game. $10/mo to subscribe to ongoing content creation. Really cool stuff!